There was a group ride that was to leave promptly at 6pm. I was riding from the bike shop to the meeting place for the group ride with a few other bike shop employees. The clock was nearing 6 PM, and we were flying, pedaling in desperation to beat time. Whammo. I hit a major bump in the road at over 20 miles per hour and my tire instantly went flat. With only 15 minutes until the ride took off and several miles between us and them, this didn't look good. We had the tire off and a new one back on in less than two minutes. It took less than 10 seconds for the CO2 inflator to re-inflate the tire and in under three minutes we were pedaling again. We made it to the group ride with time to spare and I've never given hand-pumps a second look for emergency flats. The Road Morph is uniquely designed to handle those high-pressure situations unique to road tires. Plus, its built with Topeak quality. Which Emergency Air Supply Is Best? Its not enough to carry a spare tube or patch kit. You have to have some way to refill the tire. And the inflator vs frame pump debate is on-going, and is one that you must answer for yourself at one time or another in your cycling career. With a bicycle frame pump you have some obvious benefits. To begin with, you can fill up as many tires as you need, as often as you need too. Fill up your tire, your friend's tire, and some stranger's tire... and still be ready for any flats that may occur on the ride. The second major benefit is that you can put more air in your tires than you can with a CO2 canister. A road bike needs 100+ PSI in each tire to roll with the least amount of effort. A frame-mounted bike pump can let you do that. A CO2 canister won't. So if you get to a ride and the bike's a little low, you just add some right there. However, you do have a major disadvantage with a frame-mounted bike pump. They are tiny and they take forever to fill up anything. Most people get pretty good at pumping like fiends, but it still typically takes a little while to get riding again -- and by then you're red in the face from the pumping effort. After all, most cyclists have puny arms. As I've already alluded, I am not impartial and I love the CO2 canister as an emergency air source. It is lighter and smaller, and easily slides in my under-seat emergency pack along with the spare tube and tire levers. Sure, it only airs up a road tire to about 100 PSI (and a mountain tire to about 40), but it is more than enough to get one riding again. 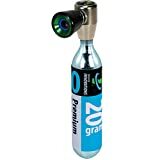 I had one unfortunate ride where I blew a tube on some glass at the start of a ride, and refilled my bike using the CO2 canister. The bike made it the whole 60+ miles on 90 PSI. So while you might have to pedal a tad harder, its not the end of the world. Typically I carry two canisters -- and I've never had to use both. 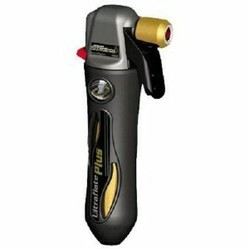 And, I do have a Topeak Joe Blow Pump that I carry in my car. That way I can make sure I am topped off before every ride, and let my friends borrow it. In fact, I've often had a lot of frame-mounted pump users, ask to borrow both my full-size pump and my CO2 canisters. They are just that much easier. And, most times, easier is more fun. Work smarter not harder is what they say. It varies slightly from pump to pump, but basically, after you have installed the new tube, you want to rapidly screw the adapter onto the CO2 canister. This punctures the canister while simultaneously keeping the CO2 from escaping prematurely. Then, put it over the tire valve and press. Sometimes there is a trigger you squeeze to release the CO2 and other times you just put it on the tire valve. And, for heavens' sake, use a 16g CO2. It gives you enough air to actually pump up the tire sufficiently. Which Do You Choose? Scroll Down To Vote! There are two ways to help reduce the amount of flats while riding. The first has to do with maintenance. The second, with riding technique. This Tire Has Something Stuck In It. Can You See it? Carefully rotate the tire and search for debris that may be stuck in it. Use something small, like a paper clip, to pick it out. Re-inflate the tire and over-inflate by 5-10 pounds. Go back over the tire and everywhere a piece of debris left a divot, fill it in with superglue. Let the glue dry, and then decrease the tire back to its correct pressure. Always inflate tire right at their maximum. It helps avoid "pinch flats" which can occur when you go over bumps. Watch out for debris. It's better to look ahead and miss sharp-looking rocks, glass, wires and other asundry junk you might find on the road. Avoid bumps. They cause pinch flats. If you must go over a bump you want to stand on the pedals so as to distribute the weight evenly. If you have clip-in pedals you can actually do a little "bunny hop" and lift the bike over the crack or bump. And, if you do get a flat, be sure to have the inflator of your choice along with a tube and a couple of tire levers.